Don't live well with fishes, plants, invertebrates that need warmer, softer, acidic water. Hello crew, love your site I get tons of info from you guys. I have a 29 g tank with all my water levels reading right. Live stock in the tank, 2 Dwarf Gouramis, 2 Chinese algae eaters, 1 black moor,1 male Betta, 5 small Endler's and 8 male guppies. 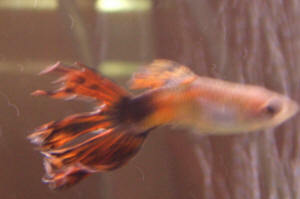 <You do realise that Endler Guppies and Common Guppies will hybridise? 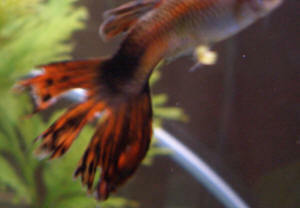 My question is why is one of my guppy's getting chased around by one other male and two Endler's? Thank you very much for any response and help you offer. I hope this grammar is appropriate I don't want to bump heads with Neale.